Sun-Maid knows Santa is fed up with dry, bland, store bought cookies. 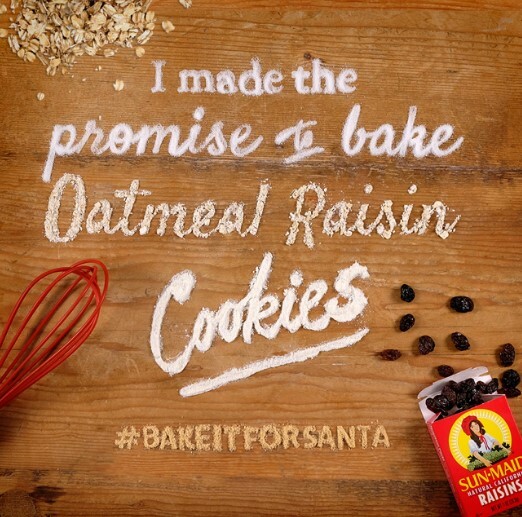 They want you to bake him some Oatmeal Raisin cookies and sharing could win you a Kitchen Aid Mixer and more! GRAND PRIZES (5) (One (1) awarded per Grand Prize Entry Period): Each winner will receive an Ultimate Baking Kit which includes: Le Crueset 20 piece cookware set KitchenAid Mixer. The Approximate Retail Value (“ARV”) of each Grand Prize package: $1,064. FIRST PRIZES (100) (Ten (10) awarded per First Prize Entry Period): Each winner will receive a Sun-Maid Gift Basket which includes: 12 oz. box of natural raisins 15 oz. box of golden raisins 10 ct. bag of vanilla yogurt minis 12 ct. bag of natural minis Sun-Maid spatulas (2) Sun-Maid whisk Sun-Maid cookie cutters (3) Raisin Oatmeal Recipe Cards The ARV of each First Prize package: $35. This Sweepstakes ends on 12/24/16 and you can ENTER ONCE to win.